Our annual Campus Technology Innovators awards recognize higher education institutions that take true initiative—even out-and-out risk—to better serve the campus community via technology. 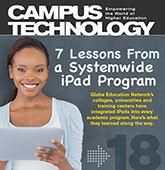 These top-notch university administrators, faculty, and staff demonstrate something more than a “job well done”; their vision and leadership have taken technology investment to new heights, to the unique benefit of teaching, learning, administration, and operations on campus. Worthy of acknowledgment, too, are the campus/vendor partnerships forged to support these innovative technology initiatives and see them through. We congratulate this year’s 11 winners, selected by our team of editors from 349 nominations from around the globe. It was challenging to choose from so many deserving entrants offering their campus tech projects as such outstanding models for other institutions of higher education. Happily, many of these compelling case studies will find their way into future articles. Our thanks to all of the 2009 Campus Technology Innovators program participants!